As a have mentioned before, I was once a chef, and for a while I worked in an Italian restaurant. 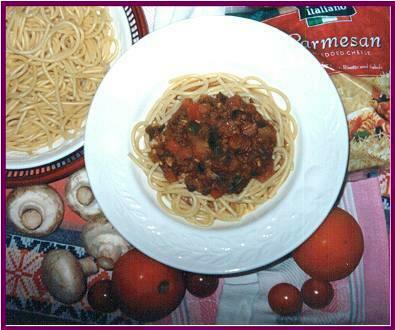 I intend to show you how to make basic bolognaise, and then use it for many other tasty dishes. Ill try not to make anything too healthy or expensive so if you are doing the cooking tonight, you might find this page useful. Before you start I'd better warm you that I consider scales to take the fun out of cooking - so I've done my best to give you and idea of what you need. If you're not happy about the result of your efforts, then alter the ingredients until you are - thats the fun of cooking. hop up onion into quite small pieces, and warm up a couple of tablespoons of olive in a pan. Add onion to the oil, and add crushed garlic and a tablespoon of dried Italian herbs. Cook onion on a low heat, preferably with a lid on the pan (this is called sweating), stirring regularly. When the onion is soft, turn the heat up to full and add the mince. Stir vigorously on full heat until mince is sealed (no longer red). Add the tin of tomatoes and turn heat down to lowest simmer. Cook for about 15 - 20 minutes, occasionally stirring. Add a sprinkling of gravy granules to thicken and add extra flavour. If the mixture is already thick, add half a cup of water and bring to the boil before adding gravy granules. Turn heat off and leave to stand for a couple of minutes before serving. If you wish to add chopped peppers to the bolognaise, add them when you add the onions. If you wish to add chopped mushrooms to the bolognaise, add them after about ten minutes of simmering. There you have it, a basic bolognaise sauce. Find a small onion and stick 6 cloves into it (no not cloves of garlic, the spice cloves). Drop it into a pan containing half a pint of milk and simmer for 10 minutes. Remove onion and any escaped cloves and get your other pan out. Now you have to make a roux be careful, red-hot butter and flour hurts if you overhead it and make it explode. Warm up your pan for a few seconds on low heat and then drop a heaped dessertspoon of butter (ok you can use cheap margarine no-one will notice) and let it melt. Add a heaped dessertspoon of flour and stir vigorously with a wooden spoon. After a few seconds you should have a gungy lump in the bottom of your pan this is your roux. Start adding your pre-made milk a bit at a time, continually stirring. Keep adding milk until it is all used up and you should have a smooth white sauce. Now is the time I think to add a white sauce trouble-shooting guide . A. Use a whisk to smooth it out. Q. My white sauce is brown. A. You had the pan too hot when you made your roux throw it away, or use it to thicken a stew. Q. My white sauce is too runny. A1. Boil it and see if it thickens (The starch in the flour may not have been hot enough to explode and thicken sauce). A2 Add a cold roux. Take an equal amount of butter and flour; mix together well (no only a bit u dont want to have to carve it). Drop it into the sauce and put back on the heat. Simmer for a couple of minutes whisking like mad. Q. I cant be bothered to make white sauce do I have to. A. Making it the above way gives a certain amount of satisfaction, and a little more flavour to your lasagne, but I havent got a problem with you just buying a packet sauce. Make your sauce just before you make your lasagne otherwise it will go lumpy. Grate a big chunk of cheese into your white sauce and add a small amount of english mustard - hey presto - cheese sauce. (I know you're not interested in cheese sauce at the moment, but it may come in useful later). Lasagne needs to be made in a tall, thin container, like a square loaf tin, or even one of those tall foil containers that your Chinese take-away sometimes comes in. As well as your bolognaise sauce and white sauce, you will need: some grated cheese, and a packet of green lasagne Verdi (if you want to make even more realistic lasagne you may want to use plain Verdi and tinned spinach. Grease your tall tin. Place a layer of bolognaise about one and a half centimetres thick in the bottom. Now place a layer of Verdi. (If youre using tinned spinach put a thin layer on top of the Verdi now). Continue this layering process until you are about 2cm from the top (told you youd need a tall tin). Top the lasagne up with your white sauce and cover in a good thick layer of cheese. Bake in a low oven for about 30 minutes, or until cheese looks cooked and bolognaise is bubbling up the side and you cant resist it any more. I like to have it with chips or baked potato go for it its cheap and easy. I'm sure I'll think of more stuff, and I'll post it as I do. What can I serve with my dinner? To make your spaghetti unhealthier, put hot spaghetti back into pan after draining, throw in a big dollop of butter and a good sprinkling of Parmesan cheese and stir it up. This is so nice that you can eat it without the Bolognaise sauce. Make some bolognaise, cook a pan of pasta, mix them together and cover in grated cheese. Make some pasta bolognaise, squash it down into a lasagne tin, cover in white, or cheese sauce, grate cheese on the top and brown in hot oven yummy.